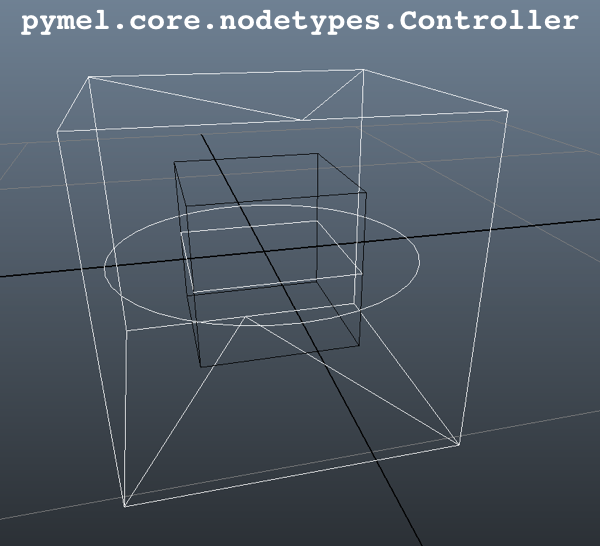 This is how you subclass PyMEL’s Transform Node to create custom shapes and node types that inherit all the methods of Maya’s Transformational Objects. Subclassing PyNodes is one of the (so-called ‘experimental’) hidden gems of PyMEL. This feature allows you to take advantage of all of the factory generated methods on each Maya node type. You can then add any of your own methods to your custom class and have it become a super-node! I’ve covered this briefly in the PyMEL Virtual Classes post, which if you haven’t read, please do, as I’ll be skipping all the basic methods illustrated there and focusing on the new implementation of the _createVirtual() method, which adds quite a bit of complexity. All the nitty gritty details are documented and outlined in the customClasses.py example in the pymel package. There’s a lot of reading there and you have to interpret it a bit to actually make your own “creation” method which I’ve always wanted to do by simply inheriting the nodetypes.Transform class, which seemed like an easy first target. Controller PyMEL class inheriting from Transform. PyMEL code should not be used inside the callback, only API and maya.cmds. # if no name is passed, then use the joint Id as the name. Now this is where things start to get juicy. _preCreateVirtual is basically your __init__ method. This is where you set your default key word arguments (aka: kwargs). We do some clever short and long name searching of the kwargs to allow for convenient argument passing into this class just as many Maya scripters are used to. Most importantly, however, we’re explicitly defining two dictionaries, kwargs, and postKwargs because _preCreateVirtual is where you figure out which arguments need to go to the “creation” method (_createVirtual) and which need to go to the “finalizing” method (_postCreateVirtual). Whatever this function returns as ‘kwargs’ will go to _createVirtual() and whatever this function returns as ‘postKwargs’ will go to _postCreateVirtual(). Makes sense, so far? _createVirtual is what you probably have never seen before so let’s dig in line be line. First we extract our variables from kwargs one at a time on lines 20 & 21. Then we simply use maya.cmds to create our shapes. The important thing is to return the strings of the objects we made which is the default return type of the maya.cmds for these particular shapes so this turned out pretty straightforward. Of course you can add as many different shape types as you want in here. Even draw your own curves and combine’em together however you wish. Don’t get too crazy in here. I think you have to stick to maya.cmds and I suspect you cannot use PyMEL in here because that just sounds too meta. Save your extra work for the next method.
""" This is called after creation, pymel/cmds allowed. avoid creating any new nodes. !Careful!, the docs in the customClasses say and demonstrate that this method gets passed the “PyNode of the newly created node”. However, we’ve overridden the _createVirtual method and returned a string in our case because silly maya.cmds only deals in strings (weak!). So note that we had to re-cast to a PyNode on line 22, first thing, if we wanted to have any of the PyNode goodness in this method. We then add our custom attr, freeze-xform that sucker, and extract our kwargs we worked so hard to pass to this method via the postKwargs dictionary in the _preCreateVirtual() method. With our extracted kwargs we can set our scale and color and finally tweak our box shape so it looks nice. where it duplicates itself on the other side of the rig. The possibilities are endless! and they’re attached right there on the object itself instead of some random command somewhere. Hope you’re seeing the power of OOP, PyMEL, and sub-classing. Now all you have to do is put all that together and see if you can get it to run in your Maya session. If so, then you’re good to go, well on your way to knowing more about Maya node creation than most and the world is your oyster! Now get to it. Start making some killer nodes and share the wealth. Special thanks to Nicholas Silveira for shape drawing and ideas putting this node together. Awesome man , really outstanding work! keep it up! Thanks for the detailed tutorial Jason. It was very helpful and I built a bunch of scripts using virtual classes. However in maya 2014 I’m getting a new error from factories.registerVirtualClass. Attempting to import your vclasssample results in this error as well. Do you know why this is and how to fix it? Yeah, PyMEL 1.0.5 has a bug in it for virtual classes (as does 1.0.4 (maya2013) on OSX side). You need to hack a line in the factories.py script. Find the declaration of the variable ‘validSpecialAttrs’ and add ‘__apicls__’ do the list. Argh, this bug is annoying. It stops me from using this feature if it means that any scripts I publicly release will require the user to go in and hack a bit of the code. Thanks for the tutorials by the way, I never even knew pymel had this awesome feature until I saw it on your site. I have done this as you said, but maya 2014 for win is hung, why? Have to step through your code line by line and see what line is causing it to hang. Looks amazing! Can’t wait to try this. Thanks for the walk throughs. the .getAttr() methods works ok however, as shown on line 99. Do I need to initialise my virtual class somehow to register the PyMel methods? Could you shed any light on this please? You are initializing properly with the last line. Its easiest to debug running it through a debugger hooked up to Maya. I’d recommend setting that up. Thanks for these posts. Couple of questions if possible? Any reason you use isinstance for _isVirtual method over comparing type? The latter allows inheriting custom classes without subclasses giving a positive. Any reason against overriding pymel’s own classes? ie inheriting animLayer and returning True on _isVirtual for extending functionality? You could always give it a try to find out for sure. whoops, my bad – I meant for the .list method. customClasses.py answers the replacement – but missing special attributes (__melcmd__, __melcmd_isinfo__, __melcmdname__) when attempting to replace with same class name. Just coming across the many inconsistencies animLayers has even within pymel, otherwise everything working as intended. Does this sound like the approach to take? And/or can you think of any drawbacks to this? I’m aware there are plenty of alternatives (attribute on time1, optionVar etc) for what I currently have planned, but this is more of an experiment than anything. It’s also working as expected atm. I’ve never made singletons before. But maybe these overridden methods when subclassing pymel is a good way to do it. If it’s working for ya, well done. What’s your use-case?